Update your home or complete a construction project easily with vinyl flooring in Downingtown, PA. Our flooring showroom offers a full selection of vinyl tile flooring as well as sheet and plank flooring suitable for any room in your home. Whether you’re improving the style of your kitchen or installing new floors in your bathrooms, vinyl is a solid choice for any space. When you need a flooring choice that is able to stand up to children and pets, water, spills and stains, and the everyday wear and tear of active families, you can count on vinyl. Once you’ve chosen your new vinyl floors, be sure to schedule vinyl flooring installation with our skilled and dedicated professionals. If you’re not sure whether to choose vinyl sheet flooring, tile, or plank flooring, reach out to our knowledgeable and friendly sales and design professionals. We’re here to help guide you to the perfect flooring choice for your home and family. 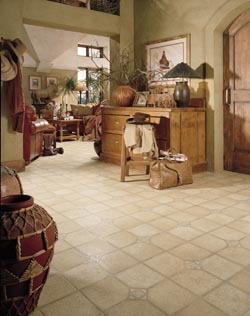 As far as maintenance and cleaning goes, vinyl flooring is one of the easiest floors to care for. With regular sweeping and prompt cleanup of any spills, your vinyl floors are sure to look and function great for many long years. For tougher stains or spills that have been sitting for a while, we recommend using a non-abrasive, vinyl-approved cleaning solution and a microfiber cloth. This ensures that harsh chemicals don't remove any protective coating or sealing solution. After choosing the best flooring style to suit your needs and style preferences, make sure you don’t forget to schedule vinyl flooring installation. Our team makes sure to use the proper methods and equipment to remove your old flooring, prepare the subfloor, and install your new vinyl floors so they remain watertight, don’t bubble or crack, and resist damage from scratches or spills. Count on us to keep your floors in great condition for many years.